Himane Sustainable Designs: Can Kenya break the global fashion industry's low-wage model? UPCYCLE: the process of converting waste materials into new products a good solution for Waste Reduction. Best Fashionable way to save the Environment. Can Kenya break the global fashion industry's low-wage model? The textile industry is the second largest employer in developing countries, but most artisans are trapped in domestic markets with no links to international trade. At a tailors’ workshop in Kibera, Nairobi’s sprawling slum, business has gone global for a group of women. After years spent sewing clothes for the local market, the 10 tailors have started on international orders for bow ties. Their client is Wakuu, a two-year-old business employing Nairobi artisans to create suits and other garments using local fabric, kitenge, which they then sell in Europe and the US. The women have been hired to create accessories and Wakuu says it will reinvest a portion of its profits into further training, as well as providing support to their families, for instance through improved childcare facilities. The Kenyan garments sector remains relatively small, with just 40,000 workers according to a report (pdf) commissioned by development organisation Hivos. But if the African Development Bank gets its way, this is set to change. In 2015 it launched the Fashionomics initiative, an online business platform designed to boost small businesses in the fashion and textile industry. The bank believes the sector could generate 400,000 jobs in sub-Saharan Africa by 2025. 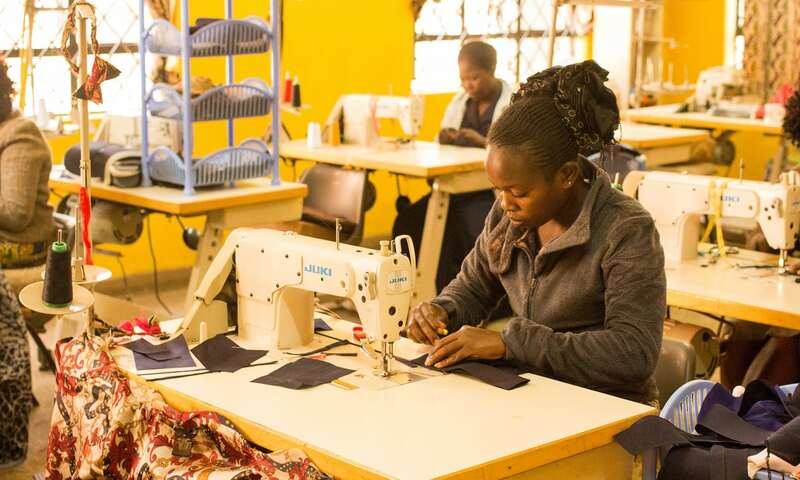 For these jobs to be sustainable, the region will need to break away from the model the fashion industry has pursued elsewhere in the world and which has already done damage in Kenya, according to Nicola Round, campaigns manager at UK-based Labour Behind the Label. “In Kenya, like many other African countries, the domestic textile industry has suffered because of the ‘race to the bottom’ by global brands seeking out low-cost labour,” says Round. Reaching global markets at all is also a challenge. The textile industry is the second largest employer in developing countries, after agriculture, but the majority of artisans are trapped in domestic markets without links to international trade. Wakuu is part of the steady flow of socially conscious fashion brands trying to challenge this norm by sourcing artisans from marginalised communities to produce their fashion lines. Others include Artisan.Fashion, which connects Kenyan artisans to luxury brands such as Vivienne Westwood and Stella McCartney in a bid to pull high fashion houses away from mass production factories. The company involves 22 community groups, recruited from existing networks like self-help and women’s groups, and is able to produce 100,000 units a year, mostly bags and accessories. Not all such enterprises succeed in scaling up and having a lasting impact, however. New York brand SUNO, worn by the likes of Michelle Obama and Beyoncé, trained Kenyan tailors as part of efforts to build a sustainable fashion business. But last year it announced it would close after failing to attract sufficient investment to take it to the next stage. Clare Lissaman, an ethical fashion consultant and co-founder of menswear brand Arthur & Henry, warns that good intentions do not always translate into sustainable businesses, and a robust business model is essential. Vreeburg, who also works for the Netherlands-African Business Council, and his business partner Nick Searra, are conscious of the potential pitfalls as they attempt to scale up Wakuu. Although the suits and bow ties have been a hit, Vreeburg says the business could not survive solely on the handmade products created by their small-scale artisans. Shunning the cheap option of outsourcing production to Asia, however, they have launched a T-shirt line made in a local Kenyan factory to boost profits and in turn support the artisans. Their website will detail where each product was made and by whom, and they are formalising a partnership with the Kibera workshop to ensure the women have a guaranteed income. Jewellery brand The Good is Good is planning to take a slightly different tack, enlisting established western designers with an existing client base to come up with designs for traditional artisans in Kenya to produce. The hope is this will ensure a sustainable market. “We are changing traditional designs a little bit but if we are to create opportunities in the western market it is important to create a product that we can sell,” says Jeff Parry, who is launching the brand this year with wife Anna. From their home in Sweden it is difficult to monitor working conditions so they have partnered with an existing Fairtrade-certified project employing women in the Maasai Mara. Himane Sustainable Designs. Awesome Inc. theme. Powered by Blogger.